It has been brought to the attention of the Committee that some league matches are not starting until 7.45pm (or later), and dragging on unnecessarily due to extended player comfort breaks between frames. Please can all Captains ensure that particularly at venues where play only takes place on one table that all league and cup matches commence promptly at 7.30pm (or earlier if sufficient players are present). their accrued points to date. The drawsheet for the Last 16 Round of the Scratch Singles is now uploaded to the league website. Please note that all matches are to be arranged by 14 February 2016 and played by 28 February 2016. 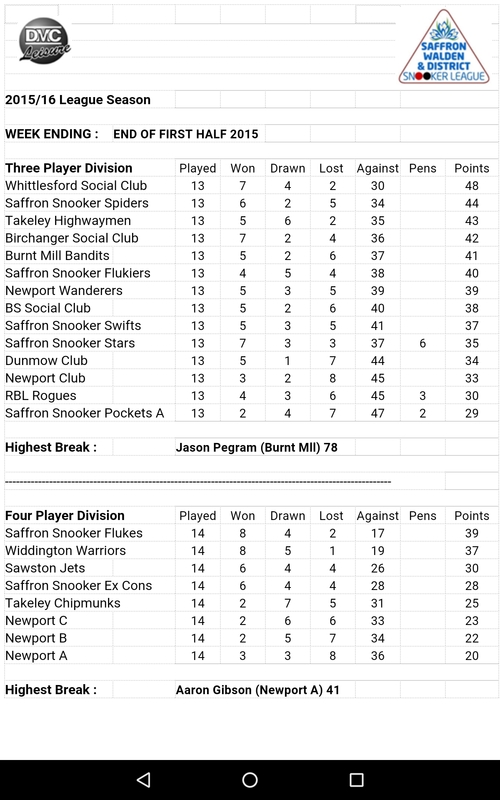 The drawsheet for the Last 16 Round of the Scratch Plus Singles is now uploaded to the league website. Please note that all matches are to be arranged by 14 February 2016 and played by 28 February 2016. The drawsheet for the Last 32 Round of the Scratch Singles is now uploaded to the league website. Please note that all matches are to be arranged by 14 January 2016 and played by 28 January 2016. The drawsheet for the Last 64/32 Round of the Scratch Plus Singles is now uploaded to the league website. Please note that all matches are to be arranged by 14 January 2016 and played by 28 January 2016. If you have a Last 64 Round match to play please get it played early in January so you have time to play your Last 32 Round match. The drawsheets for the Last 16 Round of the Handicap Singles and Handicap Doubles are now updated on the league website. Please note that all matches are to be arranged by 14 February 2016 and played by 28 February 2016. The drawsheet for the Last 32 Round of the John Webb Plate [Handicap Singles Plate tournament] is now uploaded to the league website. Please note that all matches are to be arranged by 14 January 2016 and played by 28 January 2016. The League Cup Drawsheet for the Last 16 Round is online and all matches are to be played during w/c 4 January 2016. All matches are to be played on the home team’s usual home league night and must be played during the scheduled league cup week or the team cancelling will forfeit the match.